A new lithium-sulfer battery technology under development promises to prove around four times the energy storage as current lithium ion batteries. Also, since it doesn’t use a liquid electrolyte, it’s expected to be safer (ie, less flammable) than existing technologies. It’s in the prototype phase, which usually (for stuff like this) means a couple years from production. All in all, it sounds remarkable, but what’s really cool is that announcements like this are becoming pretty common…there’s often another new fantastic battery technology mentioned in the news. It’s an indication that, overall, battery storage is quickly headed to the kind of levels where it’ll be making a big impact on our lives…first with electric cars, and soon with off-the-grid power supplies for houses and the development of ‘micro grids’. Cool stuff. Phinergy has developed a battery that’s, well, a bit difficult to categorize. It’s powered by aluminum and air, but it’s not readily rechargeable. Every 200 miles it needs to be refilled with water, and after 1000 miles, the aluminum plates need to be replaced. So, what’s the point? Well, it has some potential as a range-extender used in conjunction with a conventional rechargeable battery. This Al battery could be a ‘reserve’, or for long road trips, actually replaced enroute (the cost of the raw material being replaced would be ~$50, so it might not cost much to do this). It’s an interesting idea…and ideas like this take creative marketing and some lucky business deals to work out. We’ll see. Graphene supercapacitors to replace batteries? There’s a lot of exciting work being done in battery technology…yet your future electronic devices may end up being powered by a supercapacitor instead if research into this area pays off. Environmentally, it’s pretty awesome…graphene is of course carbon, which is plentiful and non-toxic (potentially, you could even throw a used graphene supercapacitor into your compost bin!). These supercapacitors can store a lot of energy and be recharged extremely quickly (like 100-1000 times faster than a battery). It’ll be interesting to see which wins out here…advanced battery technologies, or supercapcitors? Stay tuned to Peak Geek for all the latest on that, and in the meantime, check out the video below describing these graphene supercapacitors (I love that word, especially as they didn’t mention ‘nano’ anything). Researchers at USC have made some progress in improving lithium ion batteries, with tests suggesting a three-fold increase in energy storage and fast recharge times. Their technology is…well..honestly, the description had too many ‘nano’ items in it and that made me a bit skeptical…it’s a bit of a media buzzword that I grow wary of. But, well, here goes. They used nanoparticles, nanospheres, nanowires, and nanotubes (naturally). Yeah. Well, if you want to juicy technological details of how they did it, follow this link. The most important thing to realize is that this is just one of many efforts being made to improve battery technology…and there are a LOT of competing teams of scientists and engineers getting really close to bringing this to your home. Expect vastly improved batteries in a matter of just a few years (if that). In my quest to live a more sustainable life, I’ve transitioned to rechargeable batteries wherever possible (read more here), and have finally tackled the remaining piece of that puzzle – rechargeable 9V batteries. I found these to be surprisingly rare, and settled on one of the few options from Amazon, the charger and batteries from Tenergy. I suppose there’s not much to say about the batteries…and that’s a good thing! As for the charger, well, it works and charges the batteries, but I was disappointed by the quality. Tenergy used cheap white plastic that lets a lot of the light through, giving this charger a pink glow when charging (as the attached photo shows). It doesn’t cost much more to use a more opaque plastic in manufacturing, yet this is something companies need to really fight for when dealing with Chinese manufacturing, at least from my experience. You can spec out an awesome Lexan from Sabic (formerly GE) that will block like like this, but the factories will want to substitute a cheaper, more readily available one….which I suspect is what happened here. It doesn’t affect the charger performance so it’s not really a big deal, it’s more of an annoyance of mine to see products built less than optimally. If you’re looking for something like this, you can find the charger here at Amazon, and a 10-pack of the batteries here. Don’t think you need a 10-pack? Take a walk around your house and count the number of smoke detectors you have (should be one per bedroom plus in the common areas of the house), and the CO detectors. You might be surprised at just how many 9V batteries you need! When people talk about how long the batteries in hybrid and electric vehicles last, keep in mind that the battery is still usable at the end of its ‘life’, it just has decreased capacity (around 80% of its original capacity seems to be a common number there). 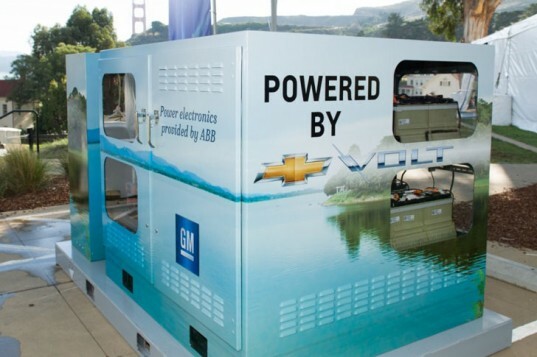 It’d be a shame to recycle a battery with so much energy storage potential…which is why it’s nice to see things like this system from GM, designed to use the cast-aside batteries from their Volts (once they get to that age, that is…it’s still a very new car). One of the systems shown here provides enough energy storage to power three to five average homes, so a more likely use would be in an off-grid system in a larger building, for example. It’s an imperfect solution, but this is an emerging market and it’s nice to see that hybrid batteries have a good chance of finding life beyond the pavement. In my opinion one of the easiest things you can do today that’s also great for the planet is to invest in rechargeable batteries. Not only do you reduce the waste that either ends up in landfills or has to be recycled, but you also save money in the long run. My favorite has been eneloop batteries (a NiMH application), and we’ve completed a transition of our household to these. If you’re new to this, start with the starter kit pictured here, as includes a charger, a selection of AA and AAA batteries, and adapter pieces to use AA batteries in place of ‘C’ or ‘D’ batteries. 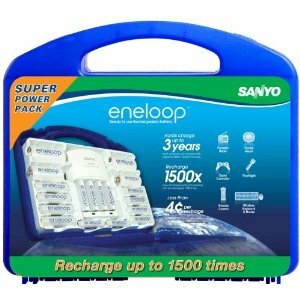 Why do I like eneloop? Reasonable cost, more than 1500 charge cycles, and they hold their charge a long time when not in use. I’ve been using them for over a year now and have had no complaints, it’s a good product and worth checking out. I just wish they’d make rechargeable 9 volt batteries for all the smoke detectors in our house! I found some by Tenergy that look promising, though I have not yet tested them for long term use in smoke detectors…that’s my next battery project. If you’re not convinced and are instead wondering which disposable battery is best, check out batteryshowdown for some comparison tests of those. Electric cars are great, but battery technology continues to be holding them back from mainstream acceptance, the limiting factors being battery capacity and cost. 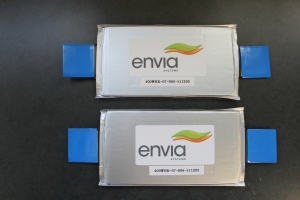 Many companies are working on this problem, and Envia Systems recently announced they’ve achieved an energy density of 400Wh/kg, roughly 2-3X the energy capacity per unit of weight as current batteries on that market and at a lower cost. You can expect to see this on the market around 2015, with the result being 300-mile range electric cars for maybe as little as $20k. Read more over at gigaom.